Larry Johnson is the world's leading cat photographer and portraitist. His book Cat Show Cats contains his exquisite photographs and wisdom about the nature of cats. He photographs at over thirty-five cat shows throughout the year in the US and throughout the world. Larry is a trained photographer with special talents to create these amazing cat portraits and has interesting narratives to share. He is a skilled photographer of animals. He is especially accomplished with cats and knows their qualities their behavior, their owners, and the cat show scene. 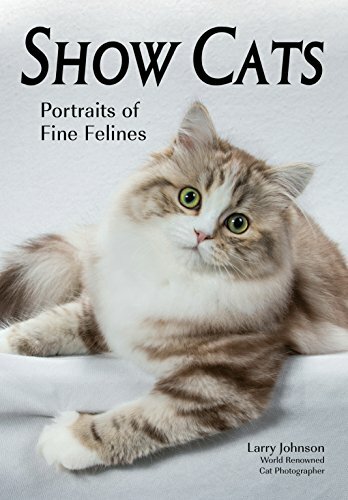 This book contains over 180 superlative images of cat-show cats. In every image, Larry captures each cat's X factor―its personality and physical attributes. In the accompanying text, Larry describes his work, the challenges, the photography, the shows, and the cats. If you have any questions about this product by Amherst Media, contact us by completing and submitting the form below. If you are looking for a specif part number, please include it with your message.